If every board member of every nonprofit organization across America read this book, it's no exaggeration to say that millions upon millions of additional dollars would be raised. How could it be otherwise when, after spending just one hour with this gem, board members everywhere would understand virtually everything they need to know about raising major gifts. Not more, not less. Just exactly what they need to do to be successful. 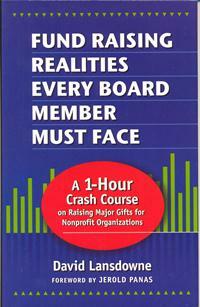 In his bestselling book, Fund Raising Realities Every Board Member Must Face: A 1-Hour Crash Course on Raising Major Gifts for Nonprofit Organizations, David Lansdowne has distilled the essence of major gifts fundraising, put it in the context of 47 "realities," and delivered it in unfailingly clear prose. Nothing about this book will intimidate board members. It is brief, concise, easy to read, and free of all jargon. Further, it's a work that motivates, showing as it does just how doable raising big money is. The appeal of Fund Raising Realities is that Lansdowne addresses every important principle and technique of fund raising, and explains them in a succinct way board members will grasp immediately. In other words, Fund Raising Realities puts everyone on a level playing field - board member with board member, and board member with staff. Put this book in your board's hands, put it in your board orientation packet, put it anywhere you need the successful practice of fundraising masterfully illuminated.